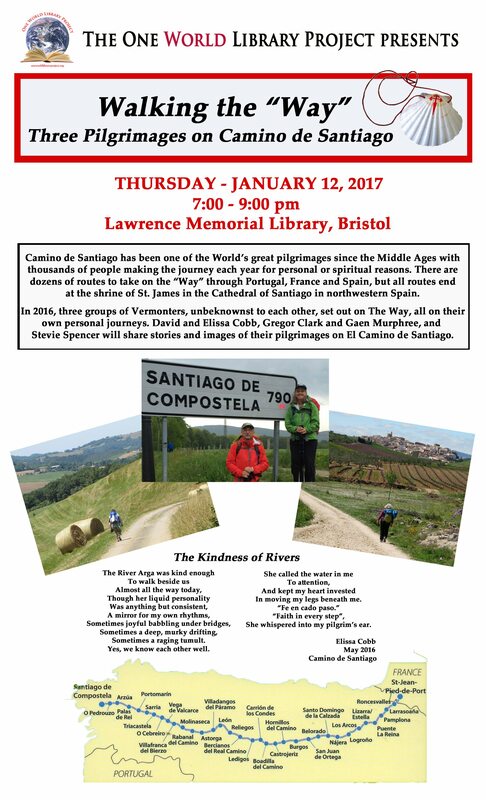 David and Elissa Cobb walked 285 km on the Camino de Santiago in late May and early June of 2016. They began in St. Jean Pied du Port in France, walking the first third of the Way and then the final 120 km into Santiago. On this cultural and spiritual journey, their experiences were both life affirming and life changing. Although it was not what they expected, somehow it was exactly what they needed, including a reconnection to each other. Both intend to return and walk additional sections of the path when possible. Elissa Cobb wrote several poems about her pilgrimage that she will share during her presentation. Read a few that are attached at the bottom of this webpage. Motivated by a long-held dream of walking the Camino, Gregor Clark, Gaen Murphree and their two teenage daughters set off this past July as a family of four to explore the Chemin du Piémont Pyrénéen—an ancient feeder route from Carcassonne that passes through the Pyrenees foothills of southern France before joining the main Camino in Lourdes. Their goals were many: to slow their lives down to a walking pace, to spend some meaningful family time together before their older daughter graduated from high school, to engage in a spiritual pilgrimage, and to share their love of French culture and language with our children. They chose this particular route based on written accounts of its scenic beauty and off-the-beaten-track nature. They set off on their journey with no set itinerary, no obligatory pace to keep, and no foreknowledge of the places they were passing through. Moving at a snail’s pace (unlike more ambitious pilgrims, they often covered as few as five miles a day), they made their way through rolling farmland, sleepy mountain villages, and lesser-known UNESCO World Heritage Sites like St-Lizier and St-Bertrand-de-Comminges. They spent most nights in pilgrims’ hostels hosted by French families, with an occasional night of camping thrown in. Along the way, they found the family togetherness they were seeking and fell in love with this less-traveled corner of rural France. Stevie Spencer’s best friend, Tina Christensen, decided to do a self-guided walk of sections of the Camino during a three-month sabbatical to travel around Europe. Like a good friend, Stevie asked to come along. Their group also included Stevie’s sister, Luisa Finberg, with whom she often travels. Even though their time on the trail was only 8 days, they saw some of the most beautiful sections, enjoying incredible food and generally staying in small towns. The Way is a film starring Martin Sheen who embarks on the pilgrimage as a way to deal with the tragic loss of his son. Travels with my Donkey is a wry story by Tim Moore, Britain's indefatigable traveling Everyman, who sets out on a pilgrimage to the cathedral at Santiago de Compostela with a donkey named Shinto as his companion, despite having no knowledge of Spanish and even less about the care and feeding of donkeys. A Million Steps is part diary, part travelogue by Kurt Koontz, who follows the yellow arrows that mark the route over high meadows of the Pyrenees and through the unceasing wind of the Meseta while also navigating through his personal history of addiction, recovery and love.